This year is shaping up to be the year of eights. Just last month, CPU reviewed AMD’s flagship Phenom 9900 running on its quad-CPU and quad-GPU Spider platform. (See page 32.) Intel’s Skulltrail represents the firm’s latest exercise in eights and makes AMD’s Spider platform look like an octogenarian in comparison. But while AMD’s platform is meant for those of mainstream means, Intel’s Skulltrail was designed for the elite PC enthusiast (relatively speaking). Although Intel hadn’t finalized prices as we went to press, the CPU, mobo, and memory combo will likely cost upward of three grand. 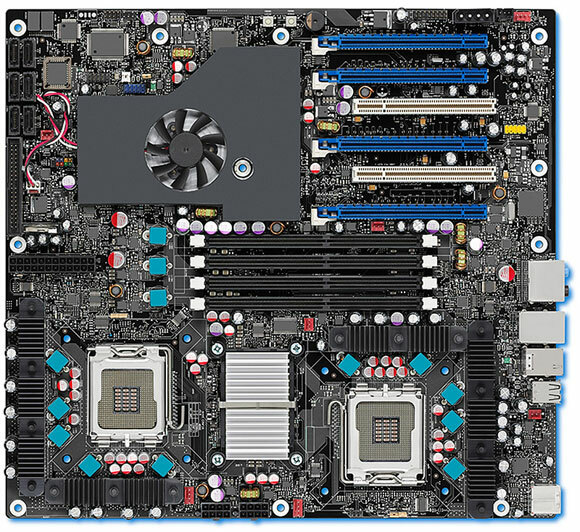 This double quad-core CPU and motherboard platform replaces last year’s V8 and avails itself of two Intel Core 2 Extreme QX9775 processors clamped into Intel’s D5400XS motherboard. Each QX9775 features a 3.2GHz clock speed, a 1,600MHz FSB, 12MB L2 cache, and a TDP of 150W. The D5400XS motherboard is built around Intel’s 5400 chipset and features a pair of LGA 771 sockets, which are traditionally reserved for Xeon processors. The QX9775 that Intel put into the Skulltrail actually bears a striking resemblance to the LGA 775-based Core 2 Extreme QX9770, which has the same clock speed, FSB, and L2 cache. For this revision of its 8-core platform, Intel decided to strike many of the original V8’s workstation-centric features, such as the integrated SAS controller and the pair of PCI-X slots, in favor of more enthusiast-friendly goodies, such as 8-channel audio, eSATA ports, an S/PDIF port, FireWire, and up to 10 USB ports. The D5400XS features four DDR2 FB-DIMM (Fully Buffered DIMM) slots, which sacrifice some latency for bandwidth, but each slot gets its own memory channel. Intel really tempts gamers and graphics professionals by including four x16 PEG slots. Better yet, Skulltrail is capable of both SLI (thanks to a pair of Nvidia nForce 100 MCPs) and CrossFire (thanks to a lack of proprietary core logic found in ATI’s architecture). Intel also set out to please overclockers by including BIOS-based frequency and voltage switches for the CPU and memory. My Skulltrail kit included two Zalman CNPS9500 AT 2 Ball CPU coolers and a pair of 2GB 800MHZ FB-DIMMs. The rest of my test system consisted of a 150GB Raptor hard drive, an ATI Radeon HD 3870 (Catalyst driver version 8.1), and an 850-watt PSU from Cooler Master. I ran our benchmark suite under the 64-bit version of Windows Vista Ultimate. Despite architectural improvements, Skulltrail didn’t fare any better than V8 in a number of benchmarks, including 3DMark06’s CPU tests, Dr. DivX, and Cinebench. SiSoft Sandra, however, revealed impressive gains in all categories. Skulltrail’s Dhrystone ALU and Whetstone iSSE3 scores were 6% and 14% better than V8’s scores. Floating Point x8 iSSE2 saw a significant 49% gain. Skulltrail also took a commanding lead in Sandra’s memory bandwidth tests, scoring 28% better than the V8 in the Integer Buffered iSSE2 test and 36% better in the Floating-Point Buffered iSSE2 test. Intel pumped Skulltrail full of everything a PC enthusiast dreams about. For most of us, the price tag is a rude awakening, but for those with fat wallets, this is one gaming and content-creation platform that won’t hold you back. The ground-breaking Intel® Dual Socket Extreme Desktop Platform is the first dual socket desktop board from Intel, the world leader in silicon innovation. With dual CPU capability that provides up to 8 core processing, the Intel® Desktop Board D5400XS delivers unmatched performance for advanced digital media creation and editing. The platform also delivers heart-pounding performance for multi-core enabled game titles, particularly in a multi-tasking environment where simultaneous applications need maximum processing power. With a PC built with Intel® processors and an Intel® Desktop Board, you can experience a more responsive and manageable environment of Microsoft Windows Vista including a new visual sophistication of the Microsoft Windows Aero* interface. Heart-pounding performance for the latest generation of multi-threaded games. System resources and hardware (such as PCI and PCI Express*) require physical memory address locations that can reduce available addressable system memory. This could result in a reduction of as much as 1GB or more of physical addressable memory being available to the operating system and applications, depending on the system configuration and operating system. This entry was posted on July 26, 2008 at 1:21 pm	and is filed under Uncategorized. You can follow any responses to this entry through the RSS 2.0 feed. You can leave a response, or trackback from your own site.